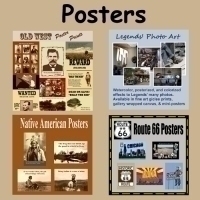 Our many Poster Prints feature the Old West, Route 66, Native Americans and interesting Photo Art. Each and every design in our Poster Print collection is an original design by Kathy Weiser-Alexander, made expressly for Legends of America and our General Store. Utilizing a number of creative processes, you will see many of our restored vintage photographs coupled with historic proverbs and sayings; images that incorporate our own photos taken during our travelers that have been enhanced with unique graphic and photo art effects; the re-invention of old style images, such as wanted posters; and bunches more. These custom designs are only available through our General Store.